Fresh off a commanding 23-7 victory over Atlanta last Sunday Night, the Patriots welcome the San Diego Los Angeles Chargers to Foxborough. Will New England prevail as expected, or can Philip Rivers and Co. pull off the upset? 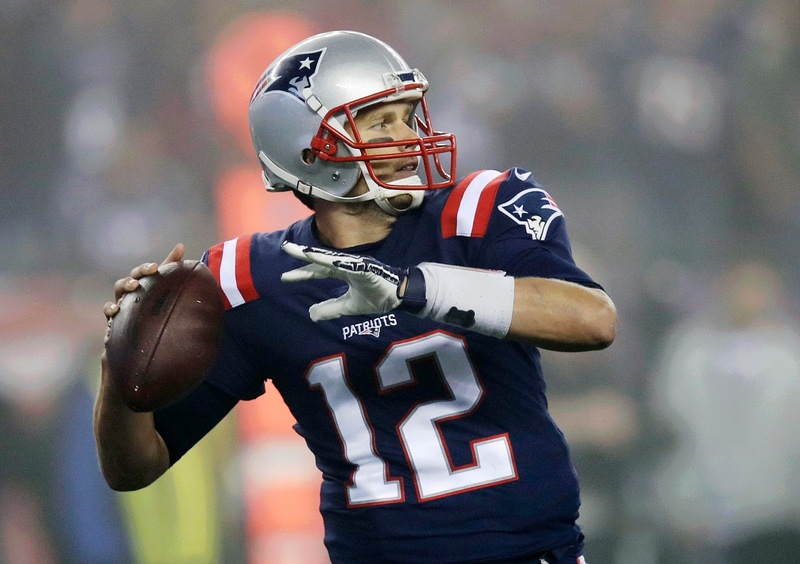 Tom Brady was ruthlessly efficient--if not spectacular--against the Falcons. The Patriots' ground game was the real star of the night, and that might be the case again against LA. The Chargers are 6th in the league in passing defense, allowing just 185 yards per game through the air, but have the NFL's worst run defense (110+ yards per game). Brady will certainly get his opportunities, and he should be started everywhere regardless, but considering the running backs' recent success this might be a more average week for the QB. Across the field, Philip Rivers has had some startable but fairly mediocre performances over the past two weeks. While he hasn't thrown an interception in that span, expect some turnovers tomorrow going up against a Patriots D that is finally starting to find its rhythm. Bench him unless you're in a deeper league or looking for a last-minute fill-in. Dion Lewis was back as the primary running back once again, and he looks to be seizing the job from Mike Gilislee in early-down work. And while the New England backfield has more runners than the Hydra has heads, Lewis is starting to become a bankable fantasy commodity as well. If he sees another heavy workload like he has the past two weeks, he might even be a weekly starting candidate. For now, though, it might be wise to put him as your flex if possible or bench him and see how he does with an eye towards playing him later. James White will be his usual self--if you're in a PPR league, play him, if not, he offers little more than flex potential on a week-to-week basis. Meanwhile, Rex Burkhead's return only continues to chip away at Mike Galilee's value. For this week at least, neither one of the pair is startable. 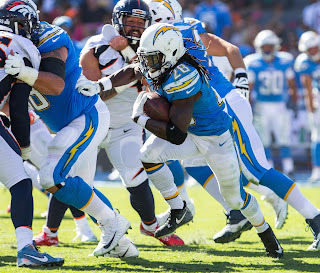 LA's Melvin Gordon was on a hot streak until the Broncos defense absolutely stonewalled him. However, the Pats run D isn't exactly like Denver's, meaning Gordon should be in your lineup this weekend. Chris Hogan has now been held scoreless for two straight weeks, but his production continues to be remarkably consistent. In five of seven games this year, he's had between 60 and 75 receiving yards, and in four of those he did it with either four or five catches. If he can find the end zone again, he should be a WR1, but even if not he deserves to be started in most all formats. Meanwhile, Brandin Cooks continues to establish a rapport with Tom Brady. He should be started as well, considering his recent production and raw explosiveness. Danny Amendola, meanwhile, is settling into a minor support role and doesn't project to be fantasy-viable unless he has another big game soon. 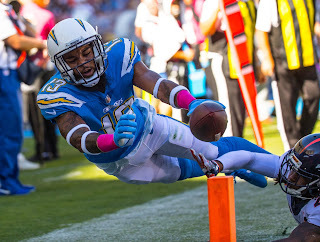 On the other side of the ball, the Chargers have been getting the job done with a spread-out passing game that sends the ball to myriad different receivers. 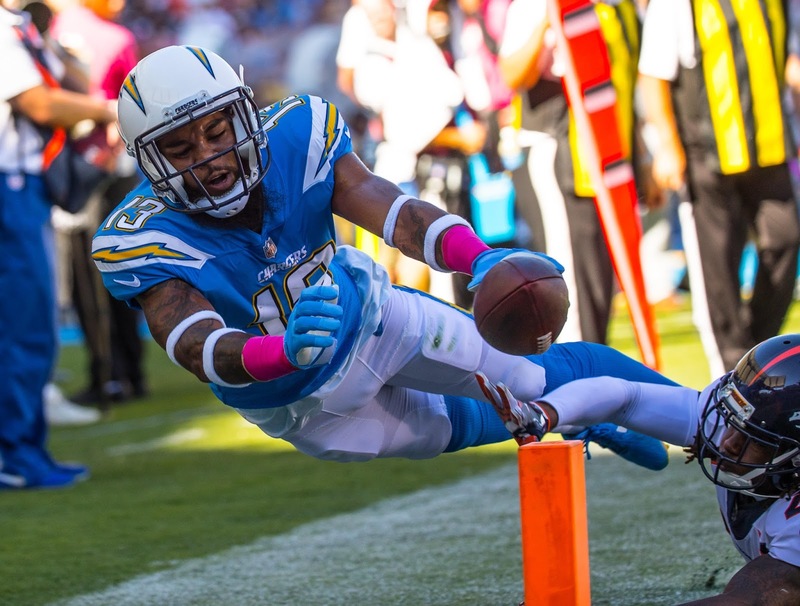 Keenan Allen is clearly the number one target, but he's only averaged around 50 yards per game this year--and that's before Bill Belichick draws up a way to take him out of the game. Beyond him, it's Tyrell Williams, who's been mostly a bench player this year after a breakout 1,000-yard campaign last season. Temper expectations for the both of them. Rob Gronkowski should be starting as long as he's healthy. You already knew that. Enough said. What you might not have known is Hunter Henry's recent emergence as a bona fide #1 tight end. The second-year man from Arkansas has backed up the potential he flashed in his rookie year, recording 73 or more yards and seven or more targets in three of the five games he's played. He should be in your lineup Sunday. After their dominating performance against Atlanta, and given Philip Rivers' turnover-prone tendencies, it might finally be time to take another look at the Patriots defense for fantasy purposes. 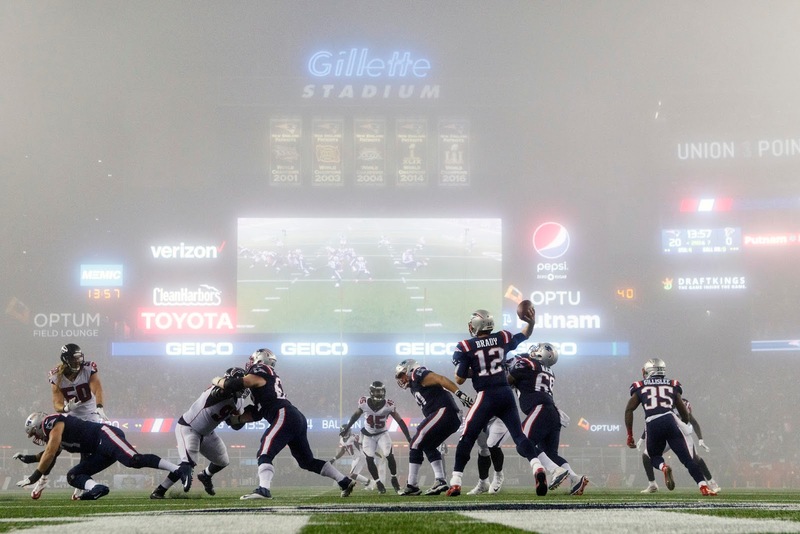 If you're looking for a boom-or-bust gamed morning streaming option, consider New England. However, with Tom Brady and a resurgent ground game, the same can't be said for the Chargers. Don't pick their defense up, and sit them this week if they're on your roster. Stephen Gostkowski is once again another premier fantasy kicker, while Nick Novak is a decent streaming option but nothing more (especially not tied to this offense).